I had coffee with a foreign friend a week ago. The subject of Donald Trump inevitably came up and my friend said that he was torn between describing Trump as a genius or as an idiot, but was inclined to lean towards genius. He explained that Trump was willy-nilly establishing a new world order that will succeed the institutionally exhausted post-World War 2 financial and political arrangements that more-or-less established U.S. hegemony over the “free world.” The Bretton Woods agreement and the founding of the United Nations institutionalized the spread of liberal democracy and free trade, creating a new, post war international order under the firm control of the United States with the American dollar as the benchmark currency. Trump is now rejecting what has become an increasingly dominant global world order in favor of returning to a nineteenth century style nationalism that has become popular as countries struggle to retain their cultural and political identifies. Trump’s vision would seem to include protection of core industries, existing demographics and cultural institutions combined with an end of “democratization,” which will result in an acceptance of foreign autocratic or non-conforming regimes as long as they do not pose military or economic threats. Sounds good, I countered but there is a space between genius and idiocy and that would be called insanity, best illustrated by impulsive, irrational behavior coupled with acute hypersensitivity over perceived personal insults and a demonstrated inability to comprehend either generally accepted facts or basic norms of personal and group behavior. Inevitably, I have other friends who follow foreign policy closely that have various interpretations of the Trump phenomenon. 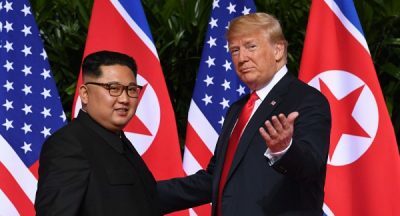 One sees the respectful meeting with Kim Jong-un of North Korea as a bit of brilliant statesmanship, potentially breaking a sixty-five year logjam and possibly opening the door to further discussions that might well avert a nuclear war. And the week also brought a Trump welcome suggestion that Russia should be asked to rejoin the G-7 group of major industrialized democracies, which also has to be seen as a positive step. There has also been talk of a Russia-U.S. summit similar to that with North Korea to iron out differences, an initiative that was first suggested by Trump and then agreed to by Russian President Vladimir Putin. There will inevitably be powerful resistance to such an arrangement coming primarily from the U.S. media and from Congress, but Donald Trump seems to fancy the prospect and it just might take place. One good friend even puts a positive spin on Trump’s insulting behavior towards America’s traditional allies at the recent G-7 meeting in Canada. She observes that Trump’s basic objections were that Washington is subsidizing the defense of a wealthy Europe and thereby maintaining unnecessarily a relationship that perpetuates a state of no-war no-peace between Russia and the West. And the military costs exacerbate some genuine serious trade imbalances that damage the U.S. economy. If Trumpism prevails, G-7 will become a forum for discussions of trade and economic relations and will become less a club of nations aligned military against Russia and, eventually, China. As she put it, changing its constituency would be a triumph of “mercantilism” over “imperialism.” The now pointless NATO alliance might well find itself without much support if the members actually have to fully fund it proportionate to their GDPs and could easily fade away, which would be a blessing for everyone. My objection to nearly all the arguments being made in favor or opposed to what occurred in Singapore last week is that the summit is being seen out of context, as is the outreach to Russia at G-7. Those who are in some cases violently opposed to the outcome of the talks with North Korea are, to be sure, sufferers from Trump Derangement Syndrome, where they hate anything he does and spin their responses to cast him in the most negative terms possible. Some others who choose to see daylight in spite of the essential emptiness of the “agreement” are perhaps being overly optimistic while likewise ignoring what else is going on. There are also the internal contradictions in what Trump appears to be doing, suggesting that a brighter future might not be on the horizon even if giving the Europeans a possibly deserved bloody nose over their refusal to spend money defending themselves provides some satisfaction. In the last week alone in Syria the White House has quietly renewed funding for the so-called White Helmets, a terrorist front group. It has also warned that it will take action against the Syrian government for any violation of a “de-escalation zone” in the country’s southwest that has been under the control of Washington. That means that the U.S., which is in Syria illegally, is warning that country’s legitimate government that it should not attempt to re-establish control over a region that was until recently ruled by terrorists. And then there is also Donald Trump’s recent renunciation of the Joint Comprehensive Plan of Action (JCPOA), eliminating a successful program that was preventing nuclear proliferation on the part of Iran and replacing it with nothing whatsoever apart from war as a possible way of dealing with the potential problem. Indeed, Trump has been prepared to use military force on impulse, even when there is no clear casus belli. In Syria there have been two pointless cruise missile attacks and a trap set up to kill Russian mercenaries. Washington’s stated intention is to destabilize and replace President Bashar al-Assad while continuing the occupation of the Syrian oil fields. And in Afghanistan there are now more troops on the ground than there were on inauguration day together with no plan to bring them home. It is reported that the Pentagon has a twenty-year plan to finish the job but no one actually believes it will work. The United States is constructing new drone bases in Africa and Asia. It also has a new military base in Israel which will serve as a tripwire for automatic American involvement if Israel goes to war and has given the green light to the Israeli slaughter of Palestinians. In Latin America, Washington has backed off from détente with Cuba and has been periodically threatening some kind of intervention in Venezuela. In Europe, it is engaged in aggressive war games on the Russian borders, most recently in Norway and Poland. The Administration has ordered increased involvement in Somalia and has special ops units operating – and dying – worldwide. Overall, it is hardly a return to the Garden of Eden. And then there are the petty insults that do not behoove a great power. A friend recently attended the Russian National Day celebration at the embassy in Washington. He reported that the U.S. government completely boycotted the event, together with its allies in Western Europe and the anglosphere, resulting in sparse attendance. It is the kind of slight that causes attitudes to shift when the time comes for serious negotiating. It is unnecessary and it is precisely the sort of thing that Russian President Vladimir Putin is referring to when he asks that his country be treated with “respect.” The White House could have sent a delegation to attend the national day. Trump could have arranged it with a phone call, but he didn’t. As one of the twentieth century’s leading warmongers, he may not have actually meant it, but in principle he was right. So let us hope for the best coming out of Singapore and also for the G-7 or what replaces it in the future. But don’t be confused or diverted by presidential grandstanding. Watch what else is going on outside the limelight and, at least for the present, it is not pretty.